In Turkey, chai tea leaves are harvested three times during the summer. The first budding, or sürgün, typically comes in May. The second comes in July and August. In a normal year, a third budding arrives in September. The steep fields outside of Rize, a small town on the Black Sea coast in the country’s mountainous northeast, are one of the centers of tea production in Turkey. 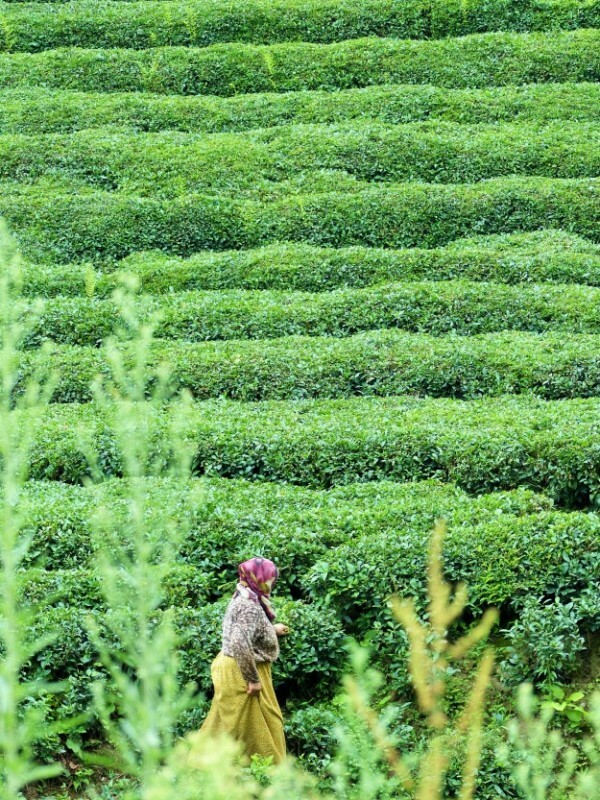 Women have long dominated tea harvesting in Rize. The work they do is grueling and hazardous. In order to avoid the sweltering heat, most begin each day at 5 or 6 a.m. and work until evening. 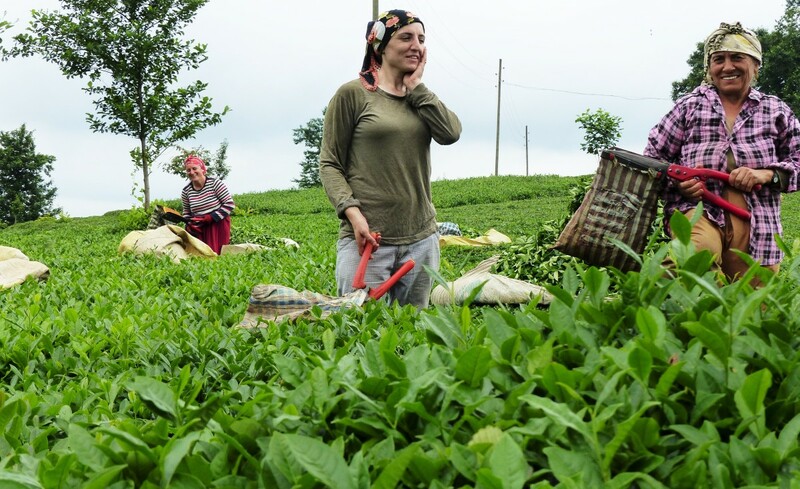 On a recent morning I drove the Rize Highway, which runs south from the coast, in an attempt to learn more about the working women of Turkey’s tea fields. It was August. The second sürgün was underway. The hills on either side of the road were green with leaves. On the shoulder several kilometers outside of Rize, a group of women were wheeling a dolly stacked with two bags of chai toward a roadside storehouse, a staging area for trucks headed to chai-processing factories. The women wore colorful and mismatched skirts—paisleys, stripes, florals—and long-sleeved shirts. Their heads were covered in scarves. Tractor trailers and cars whizzed past. The women heaved their bags onto the asphalt. Not really sacks, these 100-pound tea bags were more like oversized hobo bindles tied at the corners. As soon as they arranged the sacks next to the truck stop, leaves overspilling into traffic, it was back up the hill on what little shoulder the road provided. There was scarce time for chit chat. But they did pause to tell me that most of the cutting was done for the day. The noon sun, and the 90-degree heat, had scattered most of the harvesters off the mountains. “The men of Rize are lazy.” The expression is often repeated in these parts. I have heard it from Rize men themselves. They aren’t afraid to admit their sloth. In a strange way, the saying can be rehearsed as a kind of badge of honor, a self-deprecating smugness. A little farther down the highway, I came upon a small village called Guneyce. The main street was lined with shop windows, grocers, hardware stores, and tea houses. On the shady side of the street, in front of the post office, men sat in rows of chairs. I stopped to ask about the harvest. They had no idea. After a disparaging comment or two about not knowing, or not being able to know, what their women-folk were up to, they sent me on my way. Not far north of Guneyce I came across another group of women. Some were resting in the shade of a tree, taking a lunch of bread and fruit. Some were knee-deep in the green shrubbery, backs hunched, knuckles curled around their makas. These large shears are nothing more than manual hedge trimmers modified with a plastic guard that pushes cut leaves into a bag attached to the opposite blade. Essentially, the work is trimming shrubs. In this case, however, the hedgerow can be the size of a mountain. Slowly Kezban’s grown daughters came from across the field to listen to our conversation. Another of the women was her young neighbor. She makes 100 lira, about $40 for a full day’s work. Half a day, 6 a.m. to noon, earns $20. At the moment she was debating the value of sticking it out for the full wage. What’s striking about these women and their work is that they are expected to provide for their husbands and sons even after a long day. Most return home after a full 12 hours in the field and commence dinner preparations. In order to have lunch in the field the next day, they also make extra each night. By then, they’re easily ready for bed. As I descended the hill, pears in hand, I found Ibrahim. He stood at the mouth of an open-faced concrete shelter. Before him was a thick carpet of cut leaves. He held a hose and sprayed down the foliage, trying to keep them from cracking in the noon sun before being picked up for delivery. Ibrahim explained that he owned the field the women were tending. He pointed to the factory up the hill, a tall smokestack, where the leaves would be sold. “Tea is easy work,” Ibrahim told me. “These bushes have been here for 50 years. All you have to do is prune and fertilize and cut.” To him, it was farming simple and straightforward. Then again, he wasn’t sweating. As I headed toward Rize from Kalkandere, the sky began to gray. I found more harvesters. They seemed to be taking advantage of the overcast conditions. Along the way I did find men cutting occasionally. Some wore straw hats and shed their shirts. One group loaded a dump truck, dragging piles of leaves with rope across a cement storehouse floor. I also came across a field, not quite so steep, where a man named Cihan Turan hauled loads of tea in his wheelbarrow for three more women who were cutting. He told me the three ladies could cut about a ton of tea in a day. Closer to Rize, the road climbed well into the mountains, though the primary means of transportation in the local villages is not the road. Teleferik–miniature, jerry-rigged cable cars–stream up and down the mountain. They are meant to transport tea. From the valley below, the cables look like guy lines holding down a massive green tent. On the roadside above, men sit in phone booth-sized motor houses. When a load of tea is ready, the gas or electric motors lift the heavy bags. At various points along the road during harvest, whirring and wheezing motors reel in bulky sacks of tea like oversized fishing line. But the teleferik are not simply used for tea. Women and men alike, especially after a hard day’s labor, will often hitch a slow ride to the top of the mountain. Going down is much faster, much more fun. But also, extremely dangerous. Every year more tea harvesters in Rize die from accidents on the teleferik. Children get on without anyone knowing. Sometimes electricity goes out and people are stuck for hours hundreds of feet above ground. Cable cars may not actually be the most dangerous part of picking tea. Picking the tea is. The hills and mountains are so steep around Rize that falling from the chai fields is somewhat common. A few years ago, just behind Cihan’s field in Kalkandere, a woman lost her footing and rolled hundreds of feet to her death. Cihan said she had had a heavy tea bag on her back. Serpil’s daughter, Seda, disagreed. “It may not be hard for my mom, but it’s definitely hard for me.” She talked about the constant cutting, working morning to night, sore backs and blistered hands. She lamented spending summer vacation on the mountain, cutting tea all day. Seda said she looks forward to the day when gas-powered trimmers replace the old hand-held makas. But her mother will have none of the technology. For her, there’s nothing better, nothing more comfortable in her hand, than shears. Besides, she said, she would never trust motorized blades in the steep fields. Most of all, Serpil doesn’t see the need to make the work easier. In her mind, too many young whippersnappers aren’t willing to work. She’s been cutting chai since childhood. She’s accustomed to the hard labor and the sweat. She’s even used to doing work that men aren’t willing to do. “Are they lazy?” I asked. “Oh, definitely,” Serpil said. She’ll never have anyone say the same about her.